This simple centerpiece is easy to make according to BHG.com Simply wire together a 12" wire wreath form and a 12" floral craft ring. Poke kraft paper covered wire stems through each 4" clay standard flower pot and fold over the top edge, then secure at bottom of pot by twisting. Anchor the pots on the wire frame by twisting more floral wire around the wire frame. Alternately angle the pots toward and away from the center of the wreath. 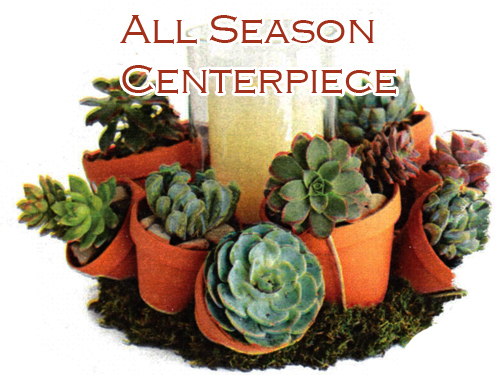 Fill the pots with succulents and tuck in moss along the bottom of the wreath. Cute, easy and fun to make! Read more.....Growing Chili peppers in pots. Read more.....How to buy plants from a nursery.